Despite debunking the claim that he has opted out of the Kwara South senatorial race, Governor Ahmed's team has been secretly canvassing for votes from the senatorial district. There has been reports that his campaign posters and banners have been placed in strategic areas in the district. 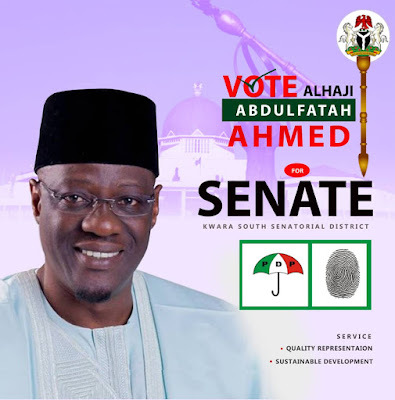 Abdulfatah Ahmed was picked to replace the serving Senator Rafiu Ibrahim by the leader of the party but was later dropped in the wake of the defeat that befell the ruling Kwara PDP in November 2018 during the re-run election that saw the APC's candidate Raheem Ajulopin emerging the winner. The incumbent Senator Rafiu was said to have been handed the ticket until recently when INEC released the list of candidates that saw Gov. Ahmed on the list. The PDP have since taken the case to court in a bid to challenge INEC on the decision to recognize Ahmed. The hearing is slated for Friday 8th February 2019 yet Ahmed have contracted people to produce posters with the underground lobbying of traditional institutions in top gear.